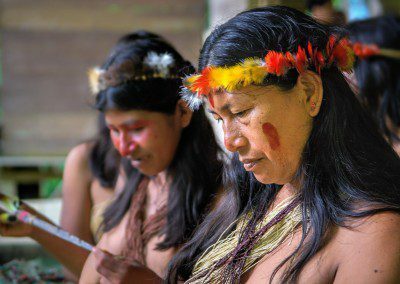 Huaorani women with their crown made of feathers of Toucan. This image contrary to the one of the little girl with her brother is not a snapshot. This was taken with the full agreement of the women. They only spoke Huao and a few words of Spanish, but their intelligence and happiness made everything easy. This was taken in natural light and I didn’t want to rise too much the iso’s, but asking the first women not to move too much I managed to get the shot at 1/40s and 400 iso. 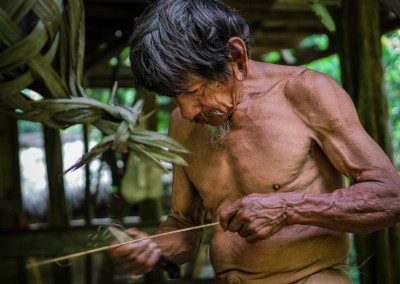 The Huaorani are one of the thirteen recognized Indigenous Nationalities of Ecuador. 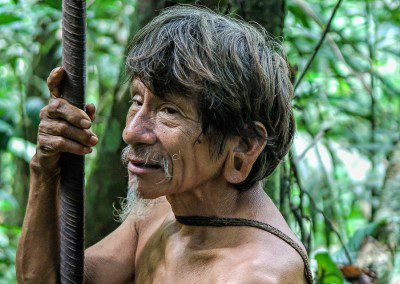 They are still often referred to by people in other regions by the pejorative term Aucas, whose meaning is: Savages of the Forest.The Huaorani are feared by many people in the region, and simply the swording of their name often inspires fear and awe. But once you get to know them, you can see beyond their formidable appearance. They are happy, very chatty and cheerful people.